La-La Land Records, Paramount Pictures, Dreamworks Pictures, Universal Music Special Markets and Amblin Entertainment proudly present the world premiere vinyl LP release of John Williams’ Academy Award Nominated original score to the 1998 feature film SAVING PRIVATE RYAN, directed by Steven Spielberg (who received an Oscar for helming) and starring Tom Hanks, Edward Burns and Matt Damon. 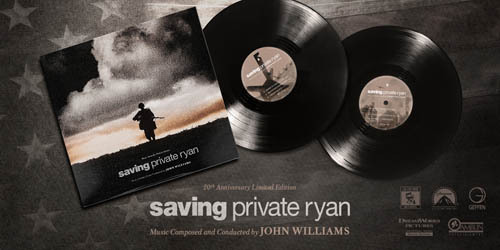 One of the renowned composer’s finest works, Mr. Williams’ powerful orchestral score is a deeply affecting memorial to all who gave the ultimate sacrifice on D-Day. The composer’s masterwork finds perfect pitch throughout this landmark film, whether underscoring the horrors of war or the emotional and unbreakable bonds of brotherhood forged within its fury.